Home World News Obama's Last Christmas card in White House. Obama's Last Christmas card in White House. 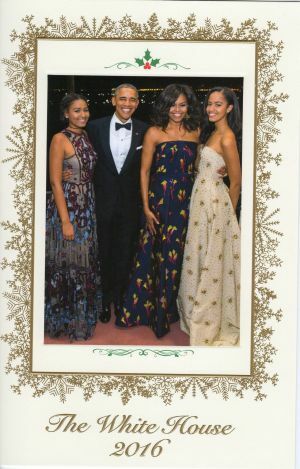 The Obama family has sent its last Christmas card before packing up the U-Haul and leaving the White House. And, boy, it's a winner. With a photo taken at a White House state dinner honouring Canadian Prime Minister Justin Trudeau in March, it features President Barack Obama, first lady Michelle and daughters Sasha and Malia in a happy family moment, long before Donald Trump was a serious contender to control the free world. Sporting a classic black tuxedo, El Pres looks proud as punch with Sasha, who is in a sleeveless gown with blue and purple brocade detailing, and Mrs Obama, in a strapless Jason Wu jacquard gown, on his arm. Malia also wore a strapless gown for the occasion. The card is in stark contrast to those sent out in recent days by our own political leaders. 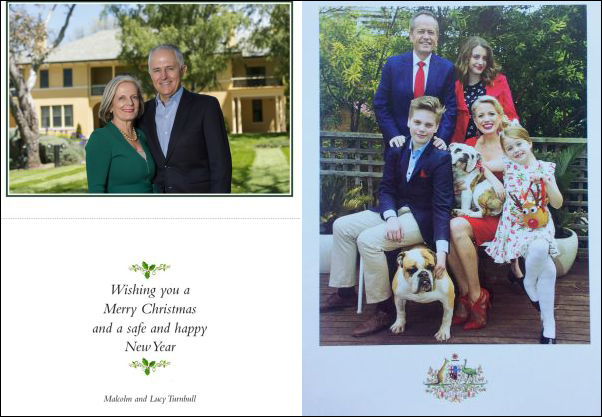 Prime Minister Malcolm Turnbull and wife Lucy's card reportedly marked a return to tradition, featuring them in a photo outside the newly-renovated Lodge. It's the first time since 2009 a PM has posed with the residence in the card, probably because it's been in a state of some disrepair for several years. Mr Turnbull, sans tie, cuts a relaxed figure, which means the photo was probably taken before the last opinion polls put his personal approval at an all-time low since he took office. Meanwhile, Opposition Leader Bill Shorten's card is a whole-of-family affair, with wife Chloe, children Georgette, Rupert and Clementine and even the family's two British bulldogs, Theodore and Matilda. Left: Straight-laced ... Malcolm and Lucy Turnbull. Right: Family affair ...Bill Shorten and family's Christmas card. The world waits with bated breath for next year's first family Christmas card from President-elect Trump.